We are thrilled to announce the promotion of Jessica Childers to Director of Accounts. Jessica joined Resource in 2007 as an Account Coordinator and has played a key role in the creative and strategic management of our branding & design projects. 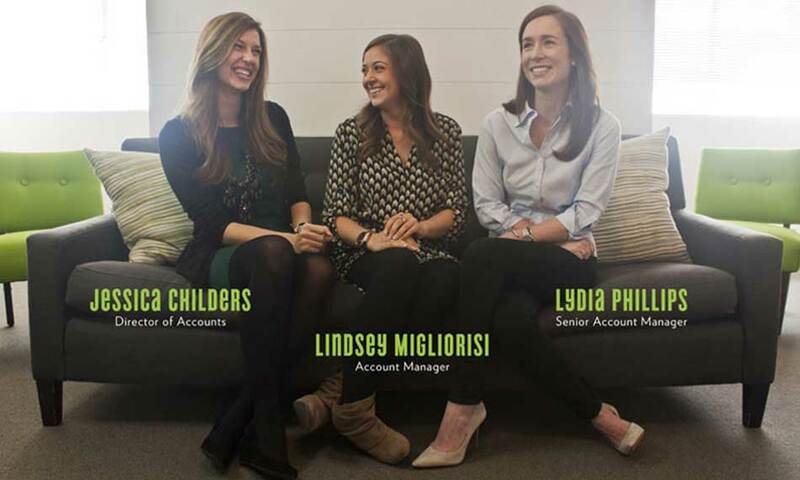 We’re also excited to announce the promotion of Lydia Phillips to Senior Account Manager. Joining us in 2011, Lydia manages projects for key real estate and non-profit clients. Please join us in congratulating Jessica & Lydia – we are excited and fortunate to have them on our team! Resource is excited to welcome our newest Account Manager, Lindsey Migliorisi. Prior to joining our team, Lindsey worked in the agency world as an Account Coordinator for Trend Influence, now a division of Doner. During that time, she managed client relationships and creative needs with a focus on social media. Following Trend, Lindsey joined the Account Management Team at Leader Enterprises where she provided support to the General Mills Customer Promotions Group for the Central Region and Publix account (a top 10 General Mills retailer). An Auburn football fanatic and Atlanta native, Lindsey brings a great deal of organization and enthusiasm to our team and we couldn’t be more pleased to welcome her aboard!